In October 2016 I was contacted by Craig Watson, UK Sales Director of Kawasaki UK, about a possible painting of Jonathan Rea as it was looking ever likely that Jonathan would win back to back World Superbike championship titles on the ZX-10R. When it came to the last race weekend at Local International Circuit in Qatar Jonathan secured the WSB title in the first race and the secret project began. 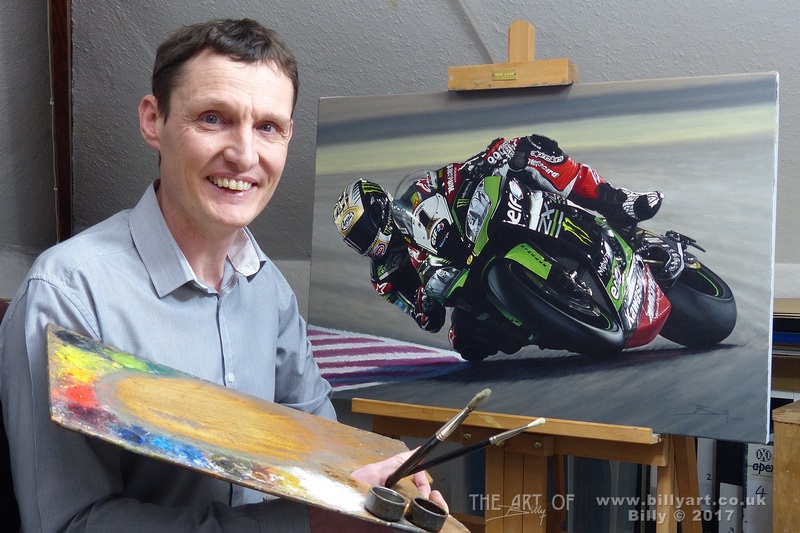 This entry was posted in Motorcycles, The Art of Billy Blog and tagged Art, Billy Art, billy the artist, Carl Fogarty, Joey Dunlop, Jonathan Rea, kawasaki, Oil Painting, time-lapse, World Superbike Champions, WSB, WSBK, ZX10r on 20/02/2017 by billy. Kawasaki UK commissioned this oil on linen canvas painting of Jonathan Rea riding the Factory Kawasaki ZX-10R Superbike when he became the 2016 World Superbike Champion. The oil painting shows Jonathan piloting his ZX-10R Superbike at the Losail International Circuit in his custom double WSBK Champion Gold Arai crash helmet. I then had to work 12-15 hour days to complete the art to dry in time to be given to Jonathan. The oil painting was presented to Jonathan Rea at the Cornmarket Motorcycle Awards on January 27th 2017. Where Howard Dale , General Manager of Kawasaki UK and Craig Watson the UK Sales Director, also presented him with an ‘Outstanding Achievement Award’ as he was the first rider in World Superbikes to win back to back titles for 17 years since Carl Fogarty. Jonathan also won the Joey Dunlop Trophy, for Irish Motorcyclist of the Year, back to back and for the fourth time in total. 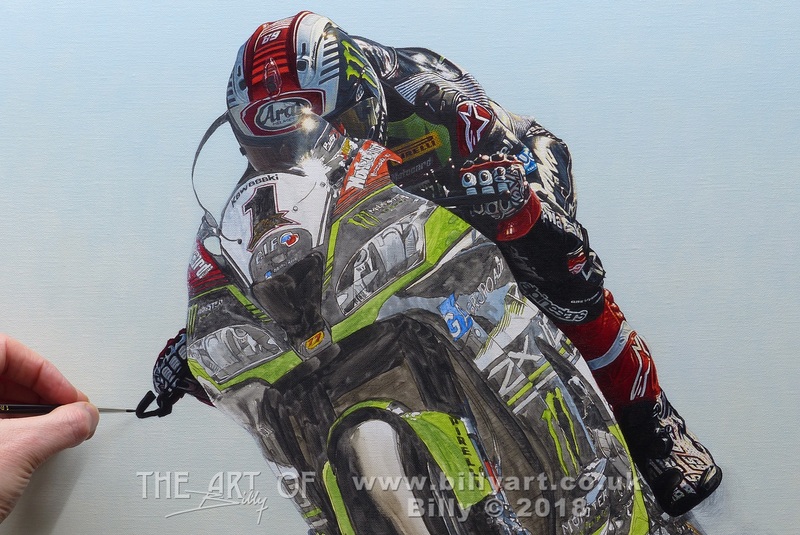 This entry was posted in Motorcycles, The Art of Billy Blog and tagged Art, Billy, Billy Art, billy the artist, Jonathan Rea, kawasaki, Oil Painting, time-lapse, Timelapse, WSB, WSBK, ZX10r on 19/02/2017 by billy. I was recently commissioned by Kawasaki UK to produce an oil painting for Jonathan Rea to celebrate his 2016 double WSBK Championship ‘Back2Back’ victory with the KRT racing team riding the Kawasaki ZX-10R. This entry was posted in Motorcycles, The Art of Billy Blog and tagged Billy, Billy Art, billy the artist, Jonathan Rea, kawasaki, Oil Painting, WSB, WSBK, ZX10r on 30/01/2017 by billy. Yesterday at Misano in Italy, the 22nd June 2014, Tom Sykes won both World Superbike races – he is the first British rider to do that since Carl Fogarty in 1999! In the videos below you will see my painting of Tom’s glorious home double win at his home round at Donington Park race track on his way top winning the World Superbike championship in 2013 – a feat he repeated in the sunshine again this year in 2014 too. Along with the slideshow video of the celebratory art commissioned and co-signed by Carl Fogarty to celebrate his World Superbike success after ten years of retirement. This entry was posted in Motorcycles and tagged Carl Fogarty, Donington, fine art prints, Misano, Tom Sykes, World Superbike Champions, WSB, WSBK on 23/06/2014 by billy.